A petunia plant is an annual flower that is difficult to grow from seed due to its small seed size. Germinated petunia seeds will present sprouts seven to 10 days after planting. The seedlings grow slowly and are not ready to plant outdoors until 10 to 12 weeks after sowing the seeds. Calculate the estimated last frost date in spring and start growing petunia seeds 10 weeks prior to that date. Moisten seed-starting soil with water until it is the consistency of a damp sponge. Fill a seed-starting tray with the moist soil. Clean a used seed-starting tray thoroughly with soap and water and let dry before filling with soil. Sprinkle petunia seeds sparingly on top of the seed-starting soil. Mist the seeds with water to push them gently into the soil. Cover the seed-starting tray with a sheet of clear plastic. Place the tray in an area that receives indirect bright light and has a temperature of 70 to 75 degrees Fahrenheit during the germination process. Remove the plastic sheet after the petunia seeds sprout through the soil. Move the seed-starting tray to an area that receives indirect bright light and is cooler with a temperature of 65 degrees Fahrenheit. Transplant the petunias into individual 2- or 3-inch diameter growing containers filled with a high-quality potting soil after the seedlings grow three true leaves. 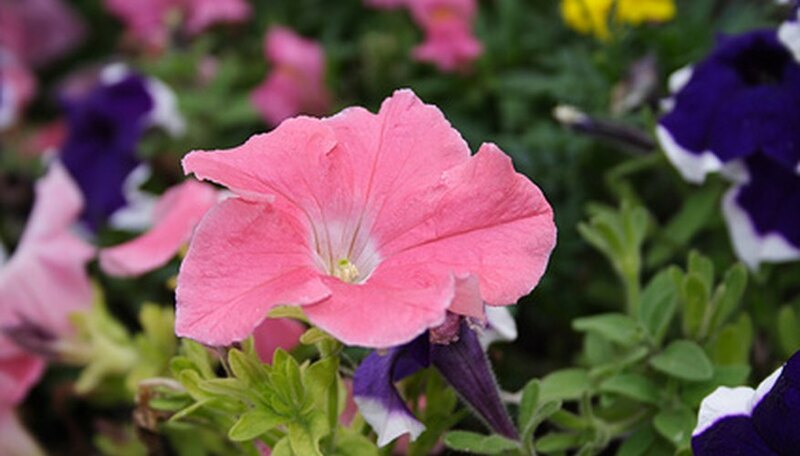 Fertilize the petunia plants every two week with a liquid fertilizer diluted to half strength. Harden petunia plants after they are 3 to 4 inches in height by placing them outdoors for three to four hours a day for three days. Increase the amount of time they are placed outdoors by three to four hours every three days until they are outdoors all the time. Transplant hardened petunia plants into containers or garden beds. Petunia seeds will germinate under grow lights when places at a distance of 4 to 6 inches from the lights. Raise the height of the lights as the petunia seedlings grow.